My friend Jim’s corn & black bean guacamole is hearty, spicy, and flavorful~a twist on traditional guacamole that might become your new favorite recipe. If you love to entertain, Jim’s corn & black bean guacamole is a must-have recipe you’ll want to keep. It is a yummy, flavorful version of guacamole that stretches 5-6 avocados into a crowd sized appetizer. 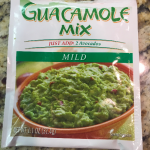 Guacamole is always a crowd pleaser, but guacamole can be a bit pricey to make for a crowd. 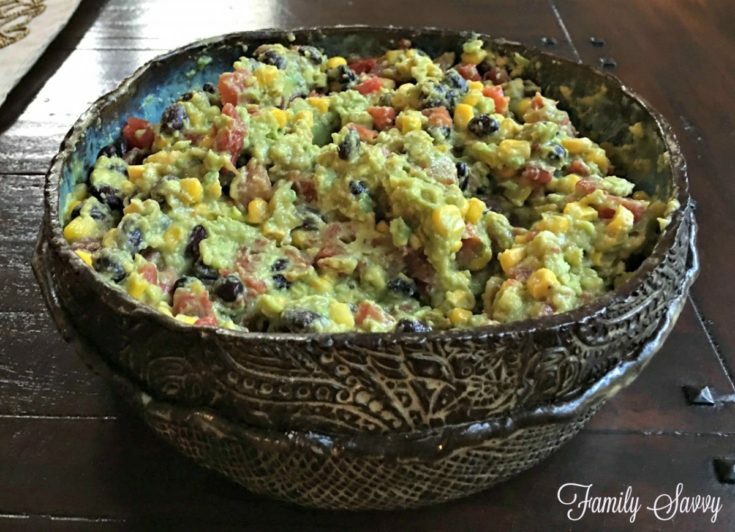 Jim’s corn & black bean guacamole is a FAB party guac, as it makes almost twice as large a portion size of guac~thanks to some savvy ingredients that “stretch the recipe” but also add great flavor, texture and color. Make Ahead: If you want to make this a day or two ahead, it will stay perfectly fresh if you do this simple trick. Squeeze fresh lime juice or pour water to cover the top of the guac and “seal” it from air. Cover; refrigerate; pour off liquid before serving. 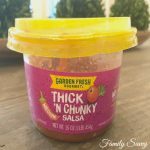 Savvy suggestion: Always drain canned items well before adding to the mixture. Refrigerating in a colander speeds the process of removing moisture from canned goods. With carrot chips or cruditÃ©s for a low-carb option. With Stacey’s Pita Chips for a low(er) carb option than tortillas. On toasted Dave’s Killer Bread (I love Good Seed 70 calories per slice) for FAB avocado toast! There you have it~Jim’s corn & black bean guacamole and several ways to make and enjoy it!! If you this, I’d love to hear from you, so please leave comments, tweaks, thoughts, etc….I love hearing from you! As always, thanks so much for stopping by. Wishing you a joyful, blessed, and savvy day! Pour black beans into a strainer; rinse under cold water. Pour Ro-Tel tomatoes and corn into colander with beans; set aside and allow liquid to drain completely. Peel and pit avacados; place in medium bowl. Loosely mash avacados with fork; sprinkle with garlic salt, salt & pepper to taste. Sprinkle guacamole seasoning on top; mix evenly throughout avacado. Add drained tomatoes, beans, corn, and juice of 1 lime. Mash loosely with a large fork until well combined and to desired consistency. Spread into serving bowl; sprinkle with more fresh lime juice. Spread leftover guacamole smooth; cover with small amount of lime juice or water, and lay cling wrap directly on top of mixture.